The dinner table at the Refuge de Pietra Piana. Let's talk about people. The woman in green is the charming Magdelana, a Swiss-German nurse. To her left is François, another Swiss-German, who dances across talus fields masterfully. To his left is Thomas, from Toulouse. Everyone is enjoying white bread and canned peaches. The room is not enclosed and it is a bit brisk. The first half of my hike overlaps with Louis and his sidekick Pierre. They are terrific old-school French guys, with heavy packs. They walk slightly stooped to bear the weight on their backs, just like in the past when Europeans carried those massive and not well balanced rucksacks. These guys put their heads down, dive in and get it done. From left to right, Eric is a French chemical engineer raised in Alsace who emigrated to Montreal because "French people are difficult". Libor is a power management engineer and businessman from Prague who has no issues with difficult French people. John and Jessica work for the US State Department and are stationed in Baghdad. John is our hiker royalty, a Triple-Crown, three-time PCT hiker. At the Col de Verde dinner table we hear about the time John was struck by lightning on a trail while Jessica was walking behind and witnessed her husband getting thrown to the ground. Cormac is an Irish fisheries inspector, a tireless Chausser d' Images (ou peut-être on peut dire un Pêcheur d' Images? ), and a sturdy drinking companion. His anecdote about "leaving his fleece in Nice" went viral on the trail. He stood in this spot for ten minutes waiting for the sun to illuminate a foreground rock. Not sure if he ever got the shot. Cormac did however capture this shot of the Californian walking past looking very determined. Way serious that guy. Day 9. It is too windy for the planned digression to Monte Rotondo so we stick to the trail. I see a lake below but come to the conclusion that my soft trailrunners are not adequate to safely descend the steep 150 feet of not-so-soft snow. I think that the guide/friend with the two obviously inexperienced women also have no business doing this descent as they clearly lack the proper equipment and training. I reach the Refuge de Manganu and enjoy an afternoon omelette. There is a safe water source at every refuge, appropriately labeled "SOURCE". The Europeans cling tenaciously to some old habits like wearing heavy and uncomfortable boots. I think the number one reason that the GR 20 has its reputation for being so difficult is the many steep descents that kill knees. Boots are the second complaint. I saw a lot of bandaged and in some cases even bloody feet. However the French are nothing if not fashion conscious. The red "Alpine" look is in vogue for 2016. Chouette. Another popular fashion is the runner/fastpacker look. Lost of fancy compression socks and spandexy clothes. I typically try to leave by 5:30 am, before the cattle call. However this morning when Eric comes to retrieve me I cannot sit up. I had the chills the night before, I sleep sixteen hours, stay awake during the next day for six, and then sleep for another ten hours. I am all alone at Manganu during the day, just me, the cows who roam the site freely, and the two Gardiens who are very kind. Just like that, I lose a whole day, and all my new friends disappear. I return to the trail. In the foreground is the ubiquitous flag of Corsica that features the head of a Moor with a white bandanna. It was adopted in 1755 by the leader of the independent Corsica government, Pasquale di Paoli. The day is not long and I end up at the Refuge Ciuttulu di Mori, just a speck on the hill shown by the arrow above. It sits under the shadow of the mountain Paglia Orba, 2525m (8284 ft), my destination for the next morning. While not the tallest mountain in Corsica, the views from Paglia Orba are the finest. View of Paglia Orba from Monte Cinto. Looks scary to climb, and for some it is. The refuge is small and is only occupied by the two Gardiens, three Dutch hikers and four Corsicans who stay up late with the Gardiens playing Corsican music and drinking wine. 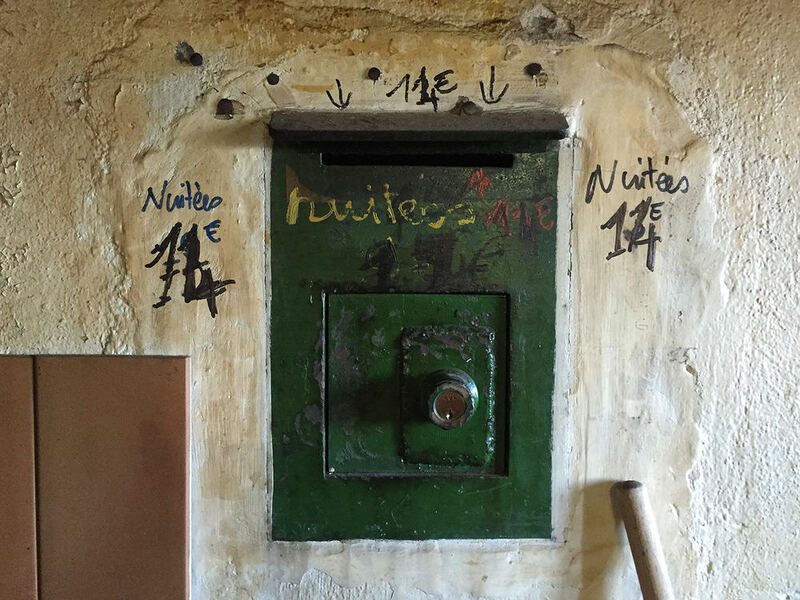 There is a box for depositing the 14 euro fee when Gardiens are not present in the Winter. The next morning I leave my pack at the refuge and take off for the summit at the same time as the four Corsicans. The path involves a level of micro decisions and climbing that is beyond the experience of most hikers, and this fact combined with the "sauvage" appearance of the rocks intimidates many. Christophe sports a constant grin and complete fearlessness as he poses for selfies at very frightening vertiginous locations. We make it to the top in two and one-half hours. From left to right: Stéphanie, Christophe, Dominique and André. Dominique has height/altitude issues and the climb up is more difficult than he thought it would be. I believe that this summit is the highlight of my entire time on the GR 20. Off in the distance is Monte Cinto, the highest mountain of Corsica and my destination in two days. I only have knowledge of one path up, however Christophe knows a guide who told him about an alternate "mountaineers route" that is more direct. After a bit of searching around for our descent we find the chute with an attached anchor. I have since found out that this route is called "Les Cheminées de Foggiale". Christophe and André bring rope and one harness in anticipation of this one difficult spot. I would never attempt it without a rope. There is a five-minute discussion about this descent. Dominique refuses to go until he realizes that no one is willing to go back with him the way we came. Christophe continues to grin the entire time. We make it back to the refuge in two hours. I thank my Corsican friends for the added adventure! This night it is raining but the Refuge Tighiettu can hold everyone and is comfy and well stocked with decent food. The discussion is about the forecast for bad weather the next day. The older route was closed last year when seven hikers were struck by falling rocks, so the only route available is the high route variante past Monte Cinto, which is a questionable undertaking in bad weather. Several people elect to stay at the refuge and wait for tomorrow, while others elect to take a bus that is provided for those unwilling or unable to do this étape. I decide to make a run of it and take off from the refuge at 5:30 am. Lisa and Ben are close behind and stop to observe one of the strange clouds that climb the valley. At the pass the weather seems to be holding well enough so Lisa, Ben and I drop packs and make for Monte Cinto 7706m (8878 ft). We take one hour to reach the top, longer than we hope for, and we become increasingly nervous about our long descent and the weather. The register box on Monte Cinto. Down we go. I am so focused on the quick descent that I do not completely appreciate the alien nature of the landscape that is communicated so well by the photo. The descent is very steep, it starts to rain and hail, and the "path" on the slick rock turns into a river. I begin to seriously regret my two hour digression to Monte Cinto. I have a perfectly miserable time inching my way down to Haut Asco. Haut Asco is a ski site that has a decent hotel with good food. My lost copain Eric took a rest day and so is there to cheer me up and join me for the final days of the hike. This is a view from the opposite side of the valley of the descent from the previous day. Looks nice from a distance, but I don't advise anyone to repeat my mistake of doing it in the rain. We arrive at Refuge de Carrozzu in the rain. The place is uncomfortably packed with people and has wet clothes hanging in the common room. Through the door one can see the dorm bunks are arranged three-high. The place is sold out and it is difficult to find a decent spot to pitch my tarp. It is the third week in June and the GR 20 is seeing a lot more traffic. The sun comes out and dries the outside tables enough for three dinner seatings. We are the third seating at 8 pm; Eric is on the left; Ben in the center is an engineer from Amsterdam; Lisa next to him is a contract administrator, also from Amsterdam. I wistfully regard the last sunset I will see on the trail. Last day. Every refuge has a small area for helicopter landings. We make it to l'Auberge De La Forêt Bonifatu for a great meal while we hang our wet clothes and tents to dry out in the back of the hotel. Eric and I spend a half-hour in a river that is deep and wide and not too cold. Perfect conclusion to a hot hike. Calenzena. The transition to civilization is eased by the quaintness of this town. Thanks for the great photo Eric! The next day I spend the day in Corte on my way to Ajaccio. Corte is the seat of the first and only independent Corsican government, led by patriot and leader Filippo Antonio Pasquali di Paoli. The old town feels a lot like a small Italian hill town and is worth the half day I spend there. Ajaccio. Backstroke floats in the Mediterranean and readjusts to life off the trail. I depart on Air Corsica. Below I see the Corsican coast and a ferry headed back to France. Perhaps some of my trail copains are on that boat. I go from the GR 20 in Corsica to The Floating Piers on Lake Iseo near Milan. It is a temporary two-week artwork created by Christo and is masterfully executed. The manner in which the walkways taper down at the sides reinforces the visual appearance of a walkway rather than a dock or pier. Everything is detailed brilliantly. The installation is much larger and more impressive than I expect. The public response to the artwork is incredible. Thousands show up. overwhelming the nearby roads. No other artist creates work on this scale, or engages the general public so completely. Christo completely funds the work himself and is an example of sixties idealism that is not generally present in the art world. Please click the button to go to the next trip, or scroll beneath for some general information about the GR 20. INFO: The GR20 is broken into 16 stages with accommodation, food and water at every stop. It has the reputation for being the most difficult GR trail because of its many steep descents and frequent interludes of a trail that turns into minor rock climbing. I did not find it so hard, but those with bad knees might suffer. There is a high route variante at almost every stage that is more interesting and sometimes even shorter than the low route. I did the hike in 14 days, following almost all of the high routes, and I also visited several nearby peaks. 12 or 10 days is not so difficult if one does double days on the lower, easier routes. Those with a limited schedule can consider doing only the southern or northern portion with Vizzavona the obvious middle transit point. Many take a break in the middle of the trip at Vizzavona and spend the day resting and stocking up supplies in nearby Corte. While the south is not as alpine as the north, I found it to be equally enjoyable and interesting. Bad weather can impede progress and it is advisable to build in at least one extra day if concerned about making a flight home. I enjoyed taking the overnight ferry from Nice to Porto Vecchio as it took me directly to the southern trailhead; many fly into Bastia in the north and either take the train to the northern trailhead or a bus to the south. In general I like hiking north and it seems that going south-north is becoming as popular as north-south. The earliest one can start is usually early June, depending on snow conditions and if one is willing to carry crampons. After June, Corsica becomes very hot. Most people do not enjoy the dormitories and the booking process is a pain that locks one into a schedule, so I took a tarp to avoid all that. Pitched tents are available to rent but may also be booked out. I think the trail is more popular than in the past so I would not trust older trip reports stating June conditions or ease of booking. A tent pitch is 7 euro, a dorm bed is 14; pitch plus rented tent is 18. Dinners are in the 14-20 euro range. Even with taking a tarp, all told I spent about 40 euro per day, and most places only take cash. 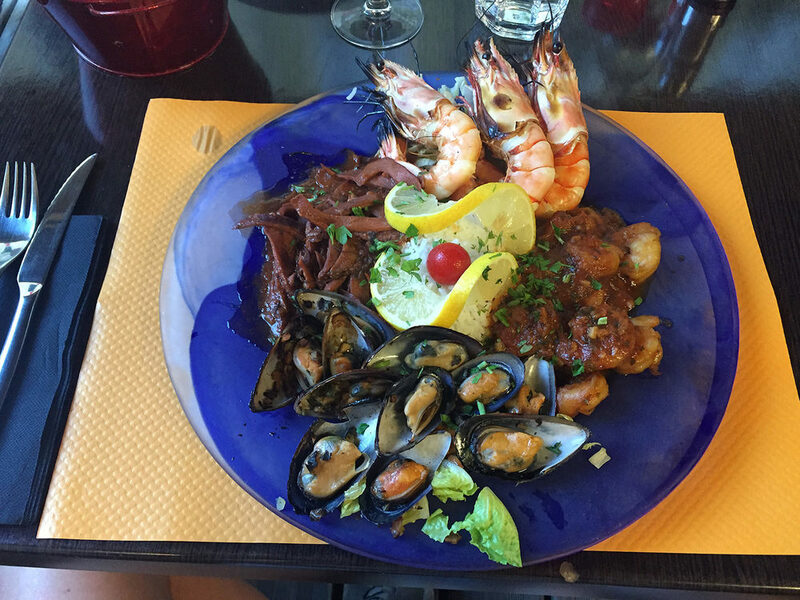 One can spend only 20 euros if not purchasing a prepared meal and alcohol. A vegetarian version of dinner is almost always available, and during my time in June I found plenty of food stocks in the refuges, including bread, local cheese and sausage, crackers and cookies, candy bars, and a variety of tinned items. I did not take a pot or stove and was able to heat what I needed at each refuge. There is plenty of safe water and there is no need to take a filter. Power for USB charging is available in about half of the locations. Opinions vary about each refuge; I found that my mood, the weather and my companions mattered far more than the individual facilities, and I consider them all basically equal, except for Asinau where the refuge is burned down and the Bergerie is marginal. Much better food is available at any refuge or hotel that sits by a road. Beer is always available and red wine is also usually available and decent. The majority of hikers are French, and as English is the lingua franca of Europe there is always someone around who can assist. The only difficulty a non-French speaker may have is off-trail where negotiating the spotty transportation options is problematic. There is nothing special about the trail that demands particular equipment, so I advise trekking poles, 1 1/2 liters of water, a light pack and trail runners or light hiking shoes like Merrel Moabs. If one follows a traditional schedule of stopping and eating at each refuge the trail experience can be very social; alternatively if one does double stages and cooks their own food they may find it more solitary. I read Paddy Dillon's book The GR20 Corsica published by Cicerone and made pdf's of a few pages; it now appears that one can buy an ePUB of this book from Amazon. I saw some other books, perhaps in German? with better hike diagrams, so it may be worth looking around at other books. The Carte en Poche Editions Didier Richard 1:50.000 map is compact and sufficient. I used the Gaia iphone GPS app with maps downloaded from OpenHikingMap HD for navigation and creating tracks. Better quality French maps and satellite views are available from the excellent iphone GPS iPhiGenie app. There is a lot useful basic information and a discussion forum on the website http://corsica.forhikers.com. The official Corsican http://www.parc-corse.org/ site is in French and is useful for information and news reports on trail conditions.